Note: Apparently some people can't see the Followers widget. That stinks. I'm looking into it. Note: Thanks, Blogger, for badgering me to get a Followers widget THAT DOESN'T WORK. I've removed it. Back to obscurity for me. OK, so Blogger says I should put a Followers widget on this site and then beg people to follow me. I've resisted this idea, because I'm 99% sure that no one will actually do it, and I'll look like the dork with no autographs in her high school yearbook. Also, I know that I personally follow a lot of blogs and websites without actually "following" them on record. So I know that not everybody wants to bother with it, or have their name plastered on someone else's site. But I'm going to try this, and I'm going to ask nicely if you'll click the "Follow" button because I'm asking nicely. I wish I had something to send to the first 50 people who do (or 10, or 5, or heck, 1, because my self-esteem is just that low). Maybe I should get some "Always Drunk" stickers made up, I don't know. What do you think? Comment if you care. So there's my Followers widget, over on the right-hand side of the page, and if you enjoy my brand of no-cost no-obligation entertainment, feel free to let me know with a click. Or don't. Man, I would make a terrible fundraiser. No wonder public television never returned my calls. 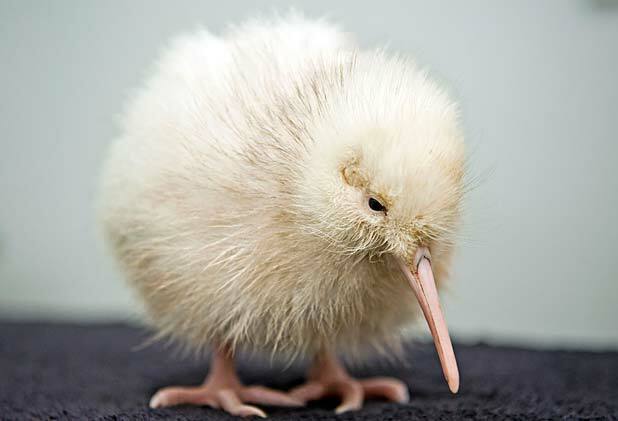 And now here's a picture of a fluffy white baby kiwi. Just my way of adding value to your day. Follow me or the baby bird gets it. No, that probably won't work, either.